Sunday, December 9th is our Winter Wonderland event! 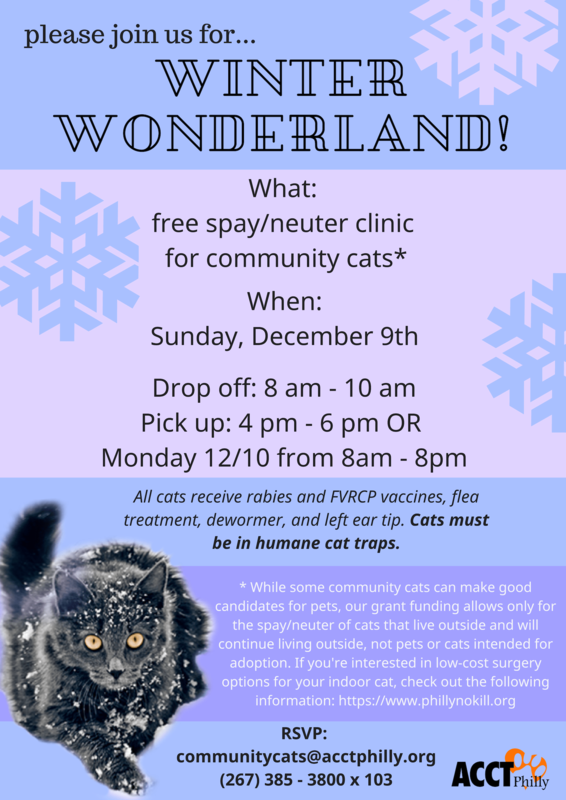 ACCT’s Community Cat Program hosts monthly TNR clinics to help spay and neuter the community cats of Philadelphia! Drop off is between 8am – 10am with pick up between 4pm – 6pm. We also offer next-day pick up at this event. Cats must be picked up by 8 pm on Monday 12/10 or they will be returned to their found location(s) by our staff..
Can’t make this event? No worries! We offer TNR services daily and will be announcing our September TNR event soon!